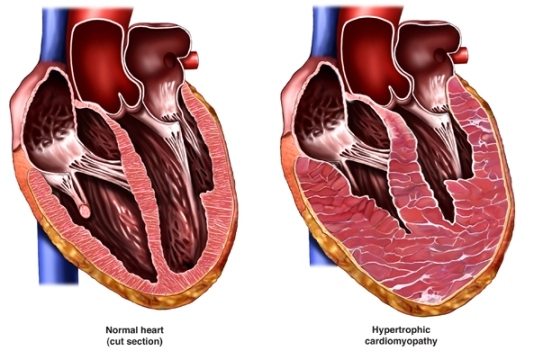 Hypertrophic cardiomyopathy (HCM) is a form of cardiomyopathy . This is a condition in which the heart muscle thickens due to genetic problems with the muscle’s structure. As the muscle thickens, it must work harder to pump blood, which strains the heart muscle. Sometimes, the thickened muscle gets in the way of the blood leaving the heart and causes a blockage. This blockage can cause the nearby heart valve, called the mitral valve, to become leaky. HCM can cause uneven muscle growth which can cause the heart to pump in a disorganized way. Rarely, it can cause abnormal heart rhythms that can even be fatal. In people over age 60, HCM is likely to be caused by or related to high blood pressure . These symptoms can be caused by some of the side effects of the condition, including heart arrhythmias . The blocked or reduced blood flow is usually the cause of symptoms like lightheadedness, fainting, and difficulty breathing. Your body's response to exercise may be tested. This can be done with a stress test . Your heart activity may be monitored. This can be done with a portable ECG . The diagnosis is only made in people who do not have other causes of cardiomyopathy such as amyloidosis , sarcoidosis , coronary or valvular heart disease. Cardiomyopathy in adults. American Heart Association website. Available at: http://www.heart.org/HEARTORG/Conditions/More/Cardiomyopathy/Cardiomyopathy%5FUCM%5F444459%5FSubHomePage.jsp. Accessed September 15, 2017. Hypertrophic cardiomyopathy. EBSCO DynaMed Plus website. Available at: http://www.dynamed.com/topics/dmp~AN~T115426/Hypertrophic-cardiomyopathy . Updated May 12, 2017. Accessed September 15, 2017. What is HCM? St. Luke's Roosevelt Hospital Center website. Available at: http://www.hcmny.org/whatis/index.html. Accessed September 15, 2017.